Mac OS was named by the company Apple as "Mac System Software" in the beginning, a specially designed operating system only for 68K first Motorola processors. With own Macintosh hardware, Mac OS takes up a special role in the world of desktop systems. The first version was "System 1" and appeared bundled with the Mac in 1984. The classic desktop is designed as a single user operating system and almost completely hides the full path to files and directories. The graphic representation is reduced to the essence. Overall the interface is very easy to use and does not need the right mouse button for user interaction. Mac OS does not include a command line interface. Starting with System 3.0, the used filesystem HFS was used officially, which does not different between uppercase and lowercase letters. System 5.0 was the first release to run several programs with the integrated MultiFinder at the same time. The operating system was programmed up to system 6.0 mostly in assembler and partially in Pascal and used a 24-bit addressing mode. Cooperative Multi-tasking could optionally be enabled in System 6. System 7.0 first supported 32-bit addressing. Thus allow the operating system can use more memory and more powerful programs. Since 1994 System 7.5 supported for the first time the PowerPC architecture and is optimized with the following Mac OS versions further on this architecture. With System software 7.6 the name was changed to Mac OS in January 1997. The optimization of the operating system to the hardware has the disadvantage that the system software can not be installed on every Mac. Application compatibility to the Mac systems may also vary with each version. 2006 MacOS X was presented for the first time publicly on x86 hardware, Apple allows the use of Mac OS X only on specific intel-Macintosh systems. According to Steve Jobs Mac OS X have been developed since 2000 internally parallel for Intel and PowerPC processors. The version of Mac OS X 10.6.0 raised the optimization to Intel-based processors further, the new operating system is no longer available for PowerPC Macintosh or pure 32-bit intel processors. In return the user receives a pure 64-bit operating system optimized for performance on multiple processors. Even the GPU computing power itself can be used with specific applications. The selection of software is focused on the creative industry and enables such as the professional graphic, audio and video editing. Office applications such as MacWrite, Microsoft Office, OpenOffice and 3D games are also available. The choice of browsers is large with iCab, Microsoft Internet Explorer, Netscape, Opera and Mozilla Firefox. StuffIt is the standard software for file compression. Mac system software 6 came onto the market in 1988. It requires 1 MB RAM and can address up to 8 MB. The file system can organize hard disks up to 2 GByte with 65,536 files. Optionally applications run with the multi Finder in cooperative multitasking. For word processing are programs such as WriteNow, MacWrite II, and Microsoft Word 4.0 available. The system 7 was first available in May 1991. The new operating system needed 2 MB RAM, optionally it can be switched to 32-bit depending from the used hardware. Cooperative multitasking is now enabled by default, the addressable memory is no longer limited to 8 MB. In addition virtual memory can be enabled. New is the direct support of networks with file exchange, AppleScript as scripting language and display of colors. Balloons provide help for the user to use the interface. With aliases are icon links to files possible, regardless of the storage location locally or from the network. The TrueType fonts are scalable to any size. The System Software 7.5 appeared in 1994 and requires at least 4 MB RAM. It was running both on 68k-Macs and Power Macintosh. In September 1996, the update System 7.5.5 includes all available bug fixes, Open Transport 1.1.2, current Ethernet driver and support for storage drive volumes up to 4 GB. With release 7.6 the company Apple changed the name for the operating system from System Software to Mac OS in 1997. At the 31. January 1999 Apple gave the Mac system software 7.5.3 public as free download. 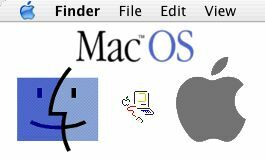 Mac OS 7.6 can be installed on every Mac compatible computer, which contains at least a 68030 processor and supports 32-bit addressing. The 24-bit addressing is no longer supported. Performance is improved in the area of virtual memory and memory management. QuickTime version 2.5 offers better image quality and benefits of multiple processors. On systems with 68040 or PowerPC processors partitions can be used of up to 2 TByte, systems with 68030 processor remain limited to 4 GB. Check of the disk after a system crash requires now much less time. 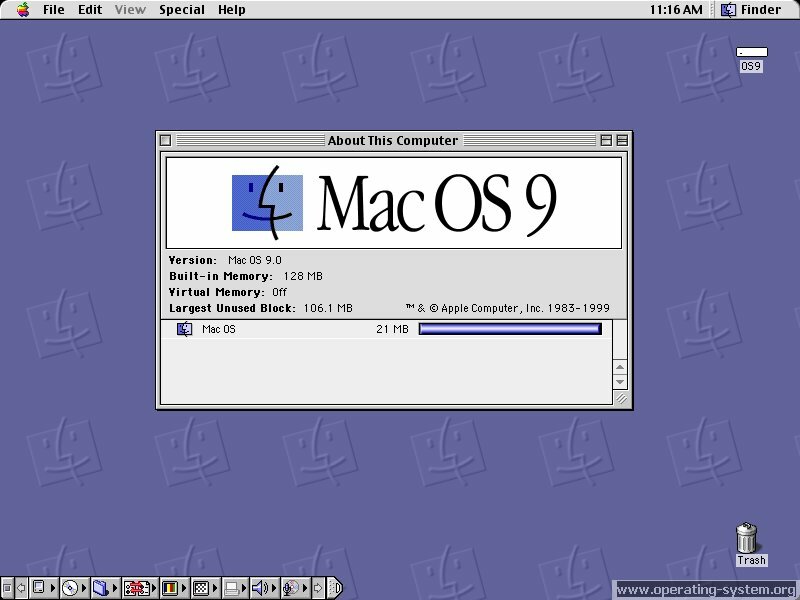 Mac OS 8 by Apple appeared in July 1997. As minimum requirements are specified a 68040 or PowerPC processor, 32 MB RAM and 120 MB of free disk space. The CTRL key is used to display a specific context menu for different actions. Finder in version 8 is now multithreaded and does no longer breaks other applications during the copy of files. The starting time of the operating system and applications is been reduced. As standard the browser software Microsoft Internet Explorer 3.0 and Netscape Navigator 3.0 are included. Inside of a TCP/IP network can shared files and printers accessed. With Mac OS 8.1 the filesystem HFS+ is included by default. Now informations are stored more efficiently on the file system and does less waste disk space in comparison of HFS. The limit of the partition size is depending on your hardware, the maximum size is now 2 TByte for all Quadra and PowerMac systems. The file system can handle up to 2 billion files with a current file size of up to 2 GB. PC Exchange 2.2 allows users the mount of DOS and Windows drives on your desktop. The supported file systems include FAT12, FAT16, FAT32, VFAT. Mac OS 8.5 further optimized the stability and speed of the operating system, Sherlock is extended for full-text search in local files and Internet search wizard for the first time. Mac systems with 68k processors are no longer compatible with this version. The throughput in Ethernet networks has been increased, AppleScript is now up to 5 x faster than the previous version. The graphical display is accelerated by new QuickDraw routines. Copying files has become faster and increase the disk throughput. A tool for system maintaining detects and fixes errors on the file system automated. The "Apple System Profiler" creates comprehensive reports about the used hardware and software. Following applications are included in current version: Finder 8.5 QuickTime Pro 3, Open Transport 2, Internet Explorer 4.01, Outlook Express 4.01, Netscape Navigator 4.0.5, Mac OS Runtime for Java 2.0 and File Exchange 3. Mac OS 8.6 requires 250 MB free disk space and 24 MB RAM. A new kernel is included which improves performance and added support for the PowerPC G4 processor. The ability of multitasking and multiprocessing has been optimized further and enhanced with new features. UDF 1.5.2 allows reading and storing data to DVD-RAM and read of DVD-ROM media. The operating system Mac OS 9 has been developed under the name Sonata and released to the 23. October 1999. The installation requires 32 MB RAM with virtual memory and a PowerPC 601 processor or higher. For models with G3 processor are at least 64 MB RAM recommended for optimal performance. The first G4 and iMac systems until summer 2000 are supported. The free disk storage should be 150 up to 400 MB depending on the installation type. 50 new features are added in comparison to the previous version. This includes support for multiple users with password and access management for files and settings. The login is available through authentication by voice. Files can be stored encrypted. The operating system can automatically update itself via the Internet. You can back up all personal passwords with a master password. The integrated search engine Sherlock 2 is extended with language and search templates. The first version "Carbon" API is available for new applications. The following applications are included in current version: Finder 9.0, Mac OS Runtime for Java 2.1.4, Apple data security 2.0 and Open Transport 2.5. Different technologies like the Mach Kernel, NEXTSTEP and tools from NetBSD and FreeBSD found influence in Mac OS X to merge the previous Apple technology with UNIX features. The operating system core Darwin is open source and can be used also on x86 computers standalone. Mac OS X works with preemptive multi-tasking and includes beside the new GUI Aqua the classic GUI from Mac OS 9. Mac OS X 10.0 came out in March 2001. To install are 128 MB RAM (256 MB RAM starting from Mac OS X 10.3.9) and 1.5 GB hard disk space (3.0 GByte starting from Mac OS X 10.2) provided. Mac OS X 10.5 requires at least 512 MB RAM and 9 GByte of free disk space. Considerable performance and comfort improvements were carried out in version Mac OS X 10.1. The surface reacts quicker at user interaction, the system start was accelerated and the OpenGL performance increased noticeable. Mac OS X 10.3 has now a GUI in metallic scheme and the optimized Finder. The use and access in heterogeneous networks was further simplified. Files can be provided with etiquettes, the compression format ZIP is now directly supported. 12 million MacOS X user were counted in October 2004. According to Apple Mac OS X 10.4 brings more than 200 new features. Features are the fast, system-wide and index-based search function named Spotlight, the Dashboard for easy access to small programms (Widgets), the Automator for the simplified composition of Applescripts for the automation of tasks. The Web browser Safari in version 2.0 now contained RSS support, the QuickTime software was updated to version 7 with support for the H.264 video codec. Further novelty is the delivery at a DVD medium, an installation of CD-ROM is no longer possible. First since the 10th January 2006 is MacOS X 10.4.4 next to the PowerPC version available for Intel based Macs. On the 6. June 2005 Steve jobs announced at the WWDC the switch to Intel processors. As further details became known that Apple had developed Mac OS X since 2000 internally also for the Intel platform. Apple released the successor MacOS X 10.5, Leopard at the 26.10.2007. With more than 300 innovations MacOS offers the user an enhanced user interface with virtual desktops, a fast file preview and Dock with 3D effect. The Finder was revised, the expansion "Boot Camp" for the installation of Windows on Intel-Macs is an official component now. As a file system ZFS is optionally available. For the surfing on the Internet the Apple Safari 3 Web browser is included. Backups can be made, managed and restored in a simple way with "Time Machine". Time Machine makes every hour the day automatically a file backup and every day a snapshot for the duration of a complete month. Lost files are recovered easily over the display of a dynamic time line of those snapshot. The security of the operating system and applications is improved by 11 enhancements. This are beside others the application-based firewall, signed applications, the use of ASLR (Address Space Layout Randomization) and Sandboxing for applications. Open Group certified MacOS X 10.5 according to the standard UNIX 03 in November 2007. MacOS X is the first free BSD derivative with such certificate to bear the name UNIX officially. The certification guarantees the use of UNIX standard implementations to porting UNIX applications easily. The first update with bug fixes was released with Mac OS X 10.5.1 by Apple on November 15th, 2007. It contains general bug fixes for the operating system to improve stability, better compatibility and safety. Mac OS X 10.5.2 cames with 125 bug fixes and smaller optimizations on January 24th, 2008. Mac OS X 10.6 is a Mac computer with Intel Core 2 Duo processor with at least 1 GB memory and 5 GB free space ahead. This operating system no longer exists as PowerPC execution. Apple placed the focus development on performance and stability. It supports up to 16 TByte memory, it is optimized for multi core processors, and is a pure 64-bit operating system. With the technology OpenCL graphics processor can speed up in specific applications calculations. Apple released macOS 10.12 as free update on 20th September 2016. The new operating system brings the personal assistant Siri to desktop computers. You can also Auto Unlock with your Apple Watch to unlock the computer automatically. The storage management has been optimized to e.g. free up local storage space and easily get rid of duplicate and obsolete files. The Universal Clipboard allows you to copy and paste images, video, and text between all supported devices. Beside of the HFS+ file system you can use the new file system Apple File System (APFS) as a developer preview on data volumes only. Highlights of APFS are e.g. native encryption, optimization for Flash/SSD storage and the Apple software ecosystem. It is planned that APFS will be the default ﬁle system for all Apple products in 2017.